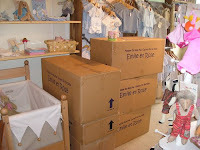 I have just taken delivery of six enormous boxes of Emile et Rose baby clothes, it is the first part of their Autumn / Winter collection. Rather alarmingly there is more to come next month. I ordered all this stuff back in January. What was I thinking?! I have snapped the boxes sitting on the shop floor awaiting my attention. The mug resting on the top contains a nice strong cup of coffee - I'm going to need the energy!